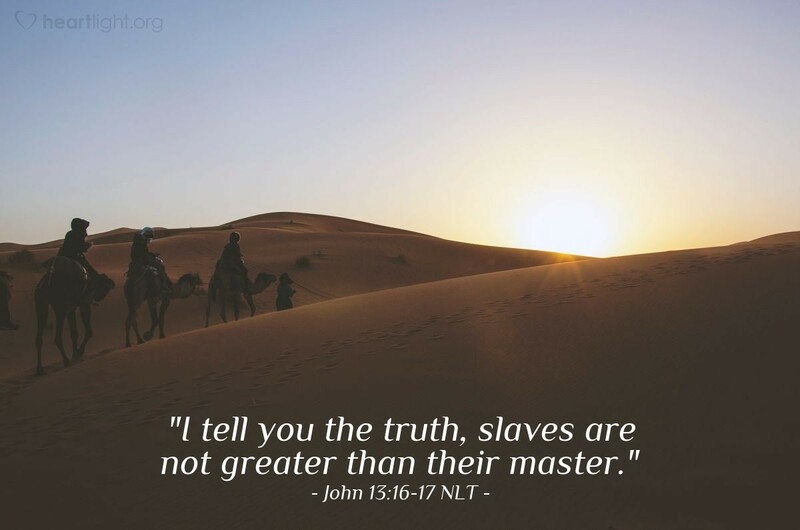 [Jesus said to the disciples,] "I tell you the truth, slaves are not greater than their master. Nor is the messenger more important than the one who sends the message. Now that you know these things, God will bless you for doing them." A good friend once remarked: "I've yet to meet a Christian whose knowledge didn't exceed his obedience." His point was simple: Most Christians know far more of God's truth than they live. That doesn't mean we quit searching and seeking God's truth, of course, but it does mean that we need to practice what we know to be the truth! Jesus said it before Nike ever thought of it, "Just do it! "® The blessings in the words of Jesus can be found in putting them into practice daily! Forgive me, Father, for the times I've frittered away my opportunity to learn more of the words of Jesus because I didn't want to have to obey them. Father, I do want to keep learning and growing in knowledge of you and your truth. I also ask, dear God, that you give me the courage to live with obedience to your Son's words as well as a passion for learning his teaching. In Jesus' name. Amen.